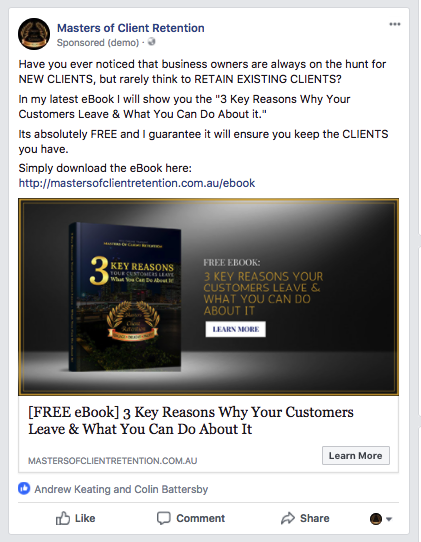 Audience, Offer & Destination – The 3 Steps to a Successful Facebook Ad Campaign. I then go on to ask what their strategy was, usually with the sound of crickets in the background. In my opinion, boosting a post is simply a branding ploy, which is fine, however our goal is to get real leads that turn into sales, so you can put food on the table for your family. To achieve this, we use a 3 step process known as audience, offer and destination. I’ll break down each of these so you know why they’re important. While that may be the case, to get a good result with Facebook ads, you need to dig deeper. At LBD Marketing, we like to work with a “warm audience” first. We are lucky enough that Facebook gives us the opportunity to create custom audiences from assets we already own. Lets say you had a list of past clients who have a common interest in that they have already purchased your product or service. With Facebook Audiences, you can upload a CSV/Excel list of emails or mobile numbers and Facebook will match them to an existing account. Once you have done that, you can expand that audience by creating a “Lookalike Audience,” also known as a LAL. A LAL is created by looking at the characteristics of the custom audience and finding similar people on Facebook that also have those traits in common. You can still segment this LAL via age. location, gender etc. In our experience, a LAL will give you a better audience that produces better results. The second step in our Facebook ad strategy is the offer. Going for the direct sell usually doesn’t work too well on Facebook. Our goal is to create trust in order to build a lead that can turn into a high ticket sale. One of the ways we do this is via an ebook or some other type of content bait. The reason this really works is that it gives you, the small business owner, the opportunity to show off your expertise while capturing the lead’s details at the same time. For example, one of our clients provides personal consulting to help business owners retain existing clients. He has a high ticket service, and if he simply put out an ad saying, “We help you retain your clients, we charge $XXXX – wanna buy?” – he would have received absolutely no response. The take-away from this step is that Facebook ads work better when you are willing to provide value first, build trust and then move on to the sale once you have developed the relationship. The last step of our Facebook Ad strategy is “destination,” and it’s the step that gets ignored the most. By destination, I mean, where do the prospects land once they click on your ad? In most cases, small business owners send their ad traffic to the home page of their website. The problem with doing this is a home page generally has no direct offer and no way of capturing lead details. What you should be doing is sending them to an offer-specific landing page. The difference between a landing page and a website is that a landing page focuses on one specific offer. It has no navigation menu, so there is only one thing for the prospect to do: fill in their details. As you will see, it is very direct and straight to the point. 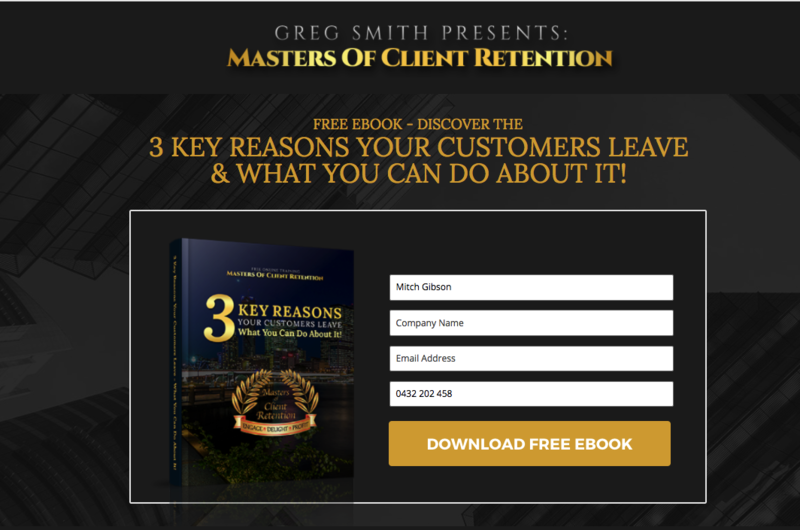 The call to action is to download the ebook and nothing is there to distract the visitor from going anywhere else.